If you’re like most people, eating is an important part of your social life, as well as a way to maintain your health. If you’ve lost your teeth, you’ve probably had to give up many of your favorite foods. Obtaining affordable quality dentures to restore your teeth may be one of the best decisions of your life, but eating with dentures can be a challenge at first. Don’t worry; with your new set of teeth, you’ll be able to enjoy steak, corn on the cob, fresh fruit, and any other foods you love. It just takes a little time and practice to adjust to eating with dentures. The tips listed below can help make it easier. Stick to soft foods like cooked vegetables, eggs, fish, and ground meats when you first start eating with dentures. Don’t worry if food seems to have less flavor; this is temporary. Your sense of taste will improve as you get accustomed to your dentures. While you’re adjusting, try adding herbs and spices to enhance flavor. Once you gain confidence, gradually add chewy and crispy foods. Chew half of the food in your mouth in the back-left side and the rest on the back-right side; this distributes the pressure more evenly on your dentures. 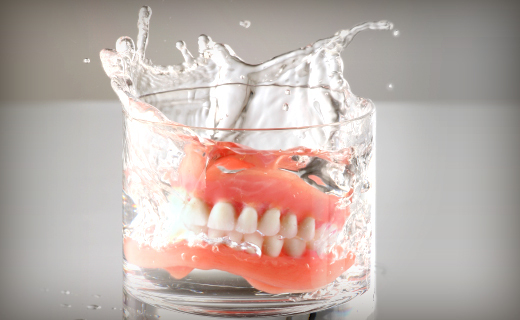 Even the best dentures may need a little help from dental care products. Unless you have permanent dentures attached to implants, you may be concerned about the risk of your new teeth slipping or falling out while you’re eating. Denture adhesives can help to prevent these embarrassing problems. They keep your dentures in place, increase the force of your bite, and help protect your mouth from trapped food particles and bacteria, which can cause irritation and bad breath. Ask your dentist to recommend the best adhesive products for your dentures, and make mealtimes worry-free.